The eldest living male in the family, in this case my eldest uncle, holds the responsibility to prepare offerings for Chuseok (추석) celebration. Here, he ritualistically pours and twice circles soju, a Korean rice wine, around incense to offer thanks to his father (my grandfather) as well as previous ancestors. Note the traditional Korean garb worn for the occasion called a hanbok (한복). 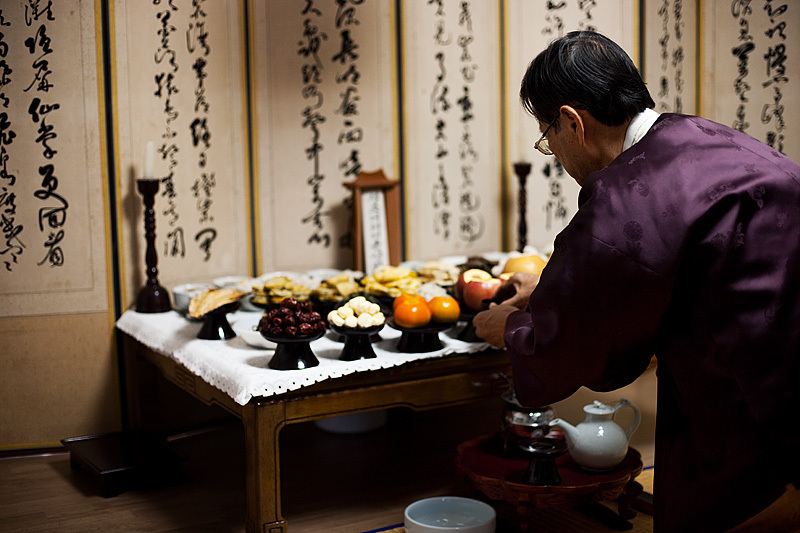 As described on Saturday, October 3, Koreans celebrated their version of thanksgiving holiday called Chuseok (추석). 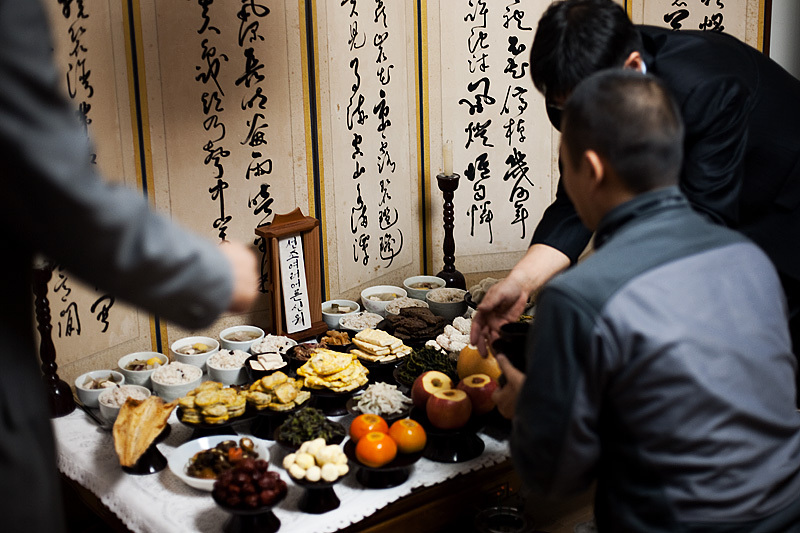 The entirety of Korea returned to their hometowns to give thanks to their ancestors and enjoy a rice cake or two. That's me bungling my way through formalities I'm seeing for the first time. It's such chaos, my two uncles hand-guide me through the ritual. That's not counting the coaching coming from the sidelines from my frustrated aunts and other uncles. And in case anyone's wondering, no, I had no idea we had to wear formal clothes for the occasion. I mistakenly thought a fleece and cargo shorts wouldn't turn my ancestors over in their graves. My cousin, I affectionately called "nuclear baby" due to the mushroom cloud perm she had during her childhood, sets the table for food intake by the males of the family. The only role of females in their arduous day is to wake up at daybreak, prepare food for the entire family and be barred from performing any of the rituals or ceremonial worship of ancestors. After ceremonies, the food we'd offered to our ancestors is swiftly consumed by the offerers for breakfast. It seems a bit like Indian-giving to me but note we're dealing with pragmatic Koreans so it's easy to understand why no food must go to waste. The eldest brother, again, offers soju to our ancestors. 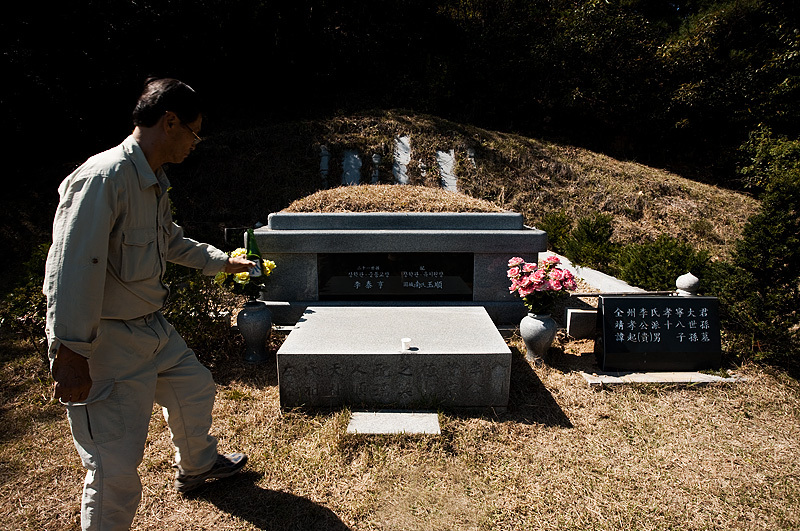 This is the tomb of his deceased parents (my grandparents). At the base, are empty shelves intended to hold the cremated remains of he and his brothers. Our duties here included landscaping and maintaining the appearance of the tomb and its surroundings. It really takes less than 1 minute. I'd really appreciate the support. Thanks a bunch! Great Photos! Thanks for sharing your photos. The images are beautiful. Do you have more photos of Korea? Thanks Elaine. Yes, there are many more photos of S. Korea. Just go to this link and it will display photos from Korea.